Persons furnishing labor or materials to a subcontractor (sometimes referred to as "sub-subcontractors or even sub-sub-subcontractors depending on their position in the chain) must send notice to a primary contractor to inform of lien rights in order to preserve their ability to claim a lien. A person furnishing labor or materials to a subcontractor is not entitled to a lien unless the person furnishing labor or materials notifies the principal contractor in writing with a one-time notice containing: 1) the name, mailing address, and telephone number of the person furnishing the labor or materials, and 2) the name of the subcontractor to whom the labor or materials were furnished, within thirty (30) days of first furnishing labor or materials for which a lien claim may be made. I.C. 572.33(1). Additional labor or materials furnished by the same person to the same subcontractor for use in the same construction project can be covered by this notice. Id. The person furnishing labor or materials to the subcontractor must also support the lien claim with a certified statement that the principal contractor was notified in writing with the one-time notice described above. Id. The notice requirement does not apply to a mechanic's lien on single-family or two-family dwellings occupied or used or intended to be occupied or used for residential purposes. I.C. 572.33(2). This article is provided for informational purposes only and should not be relied upon as a substitute for the advice from a legal professional. 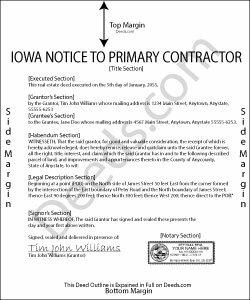 Please contact an Iowa attorney with any questions about sending notice to the primary contractor or anything else with regard to mechanic's liens.